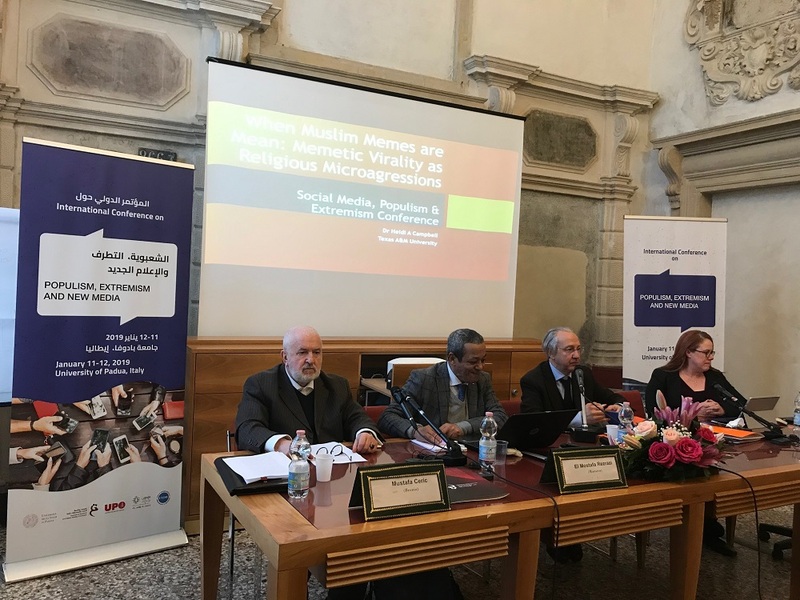 Padua, Italy: The International Conference - "Populism, extremism and New Media"
In Padua, Italy, January 11-12, 2019, was held the International Conference “Populism, extremism and New Media” organized by the University of Padua, the Institute of Research and Higher Studies of Granada, the University of Eastern Piedmont, the Mominoun without Borders Foundation for Studies and Research and the University Center for Culture, Law and Religion (FIDR). 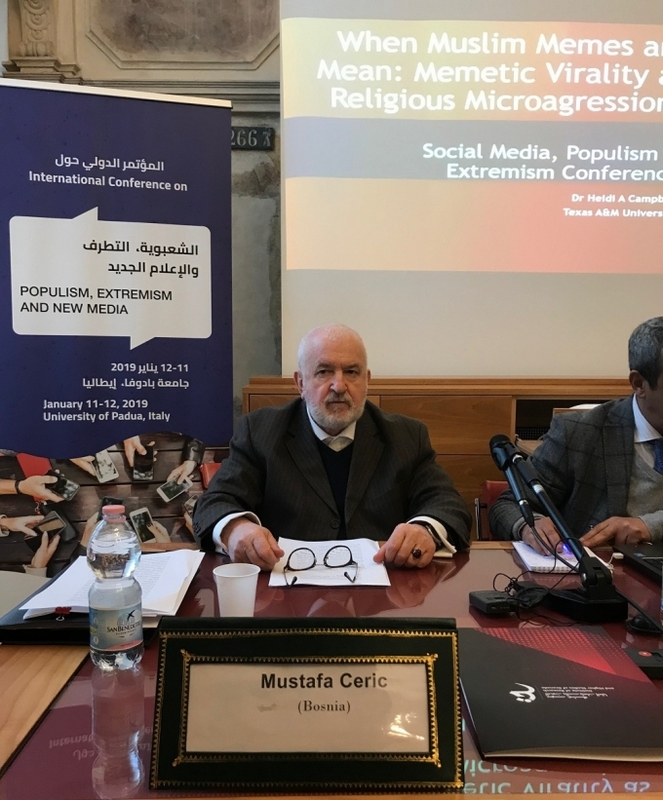 One of the main speakers was Grand Mufti Emeritus of Bosnia Mustafa Ceric, Ph.D., President of the World Bosniak Congress. Are the phenomena of populism and extremism new? No, they are not new, but they are nowadays more conspicuous and dangerous than before because of the phenomenon of New Media, i.e., the social media. But the problem is not in the media as such. The media - social or otherwise - is used as the means to highlight the end. Thus, the problem is in the human mind that defines a political or otherwise end that is presumably achievable by the way of populism that leads to extremism. Indeed, we are faced today with a shift of human mind-set not only in political thought but also in moral perception. It is obvious that today's politics is becoming more and more without morality. We (the Serbs) lie to deceive ourselves, to console others, we lie for mercy, we lie to fight fear, to encourage ourselves, to hide our and somebody else's misery. We lie for love and honesty. We lie because of freedom. Lying is a trait of our patriotism and the proof of our innate intelligence. We lie creatively, imaginatively and inventively. We know by now that the First Epochal War had cancelled feudalism together with the universal state, while the Second Epochal War had relatively defeated fascism together with racism. In the aftermath of that new development the world had been made up of nation states that had accepted to regulate their relationship by the international law and order of the auspice of the United Nations. In principle, as the members of the United Nations all nation states had accepted the Universal Decoration of Human Rights. (The 50th Anniversary of which was celebrated last year. On 10. December 1948, the United General Assembly adopted the Universal Declaration of Human Rights as "a common standard of achievement for all peoples and all nations." However, the struggle had continued between liberal democracy of the West and the authoritarian socialism of the Soviet Union. This struggle only got calm down by the Soviet collapse in 1990 and the obvious triumph of Western liberal democracy. It was thought that the world has headed toward a more stable global peace and security. But this was not so. The vacuum of the Cold War created more challenges than anyone could have imagined. It created an open space for a an ethnic and national populism and extremism in the post-communist countries that led post-Yugoslav republics in the Balkans, especially Bosnia, into a bloody war that ended in a Serbian Srebrenica Genocide against the Muslims of Bosnia. So, my paper is based on my personal experience of war in Bosnia and how it is easier to start it than to stop it because of a populist rhetoric as well as on my experience of postwar recovery or peace-building which is harder to start than to build it. But thanks to open-minded people who have been all along against a mythical populism that caused the bloody war against Bosnia and its autochthon people, the peace, although unjust, was reached after all. When Prof. Dr. Mohammed Bensalah, Director of Institute of Research and Higher Studies of Granada, Spain, kindly offered me, during our breakfast in Madrid last month, to participate at this Padua Conference on "Populism, Extremism and New Media", I accepted it without a hesitation. He suggested me to focus on the Balkans. Obviously, he assumed that it is an easy task for me because I must have been familiar with this subject matter of my area of birth and living experience. And, I thought too for the moment that I am a familiar enough with history and current affair of the Balkans that it will be a plain sailing endeavour. However, when I began to put my thoughts on the paper, I realized that it is not an easy task. I felt like St. Augustine, who said: "What then is time? If no one asks me, I know what it is. If I wish to explain it to him who asks, I don't know". Indeed, I know what is the Balkans, but if you ask me to explain it to you, I don't know. Or I know it only from a bird's eye view. But, as it is said, the devil is in the detail. Let me, then, give you a kind of a bird's eye view of the Balkans. I am lucky because I have found a good help for this endeavour from Maria Todorova, the Bulgarian historian. Her valuable work of imagining the Balkans is an Apology of the Balkans to the European jury similar to the Apology of Socrates to the Athens jury by Plato. And the charge is similar as well. Socrates was accused for "moral corruption", while the Balkans were accused for "peace corruption". 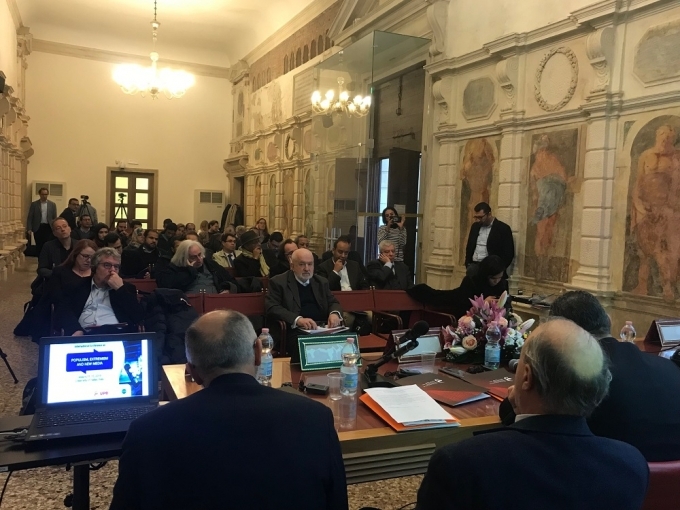 Judged guilty, Socrates was sentenced to death, while judged peace-breaker the Balkans was designated as an area of the most complicated history and current affairs on the margins of Europe. To those who have not visited them, the Balkans are a shadow-land of mystery; to those who know them, they become even more mysterious... You become, in a sense, a part of the spell, and of the mystery and glamour of the whole. You contract the habit of crouching over your morning coffee in the café, when you meet a man of your acquaintance, at least half of what you say is whispered, portentously. Intrigue, plotting, mystery, high courage, and daring deeds - the things that are the soul of true romance are to-day the soul of the Balkans. Perhaps, the Balkans, in the meantime, haven't change much except that they are not anymore "unimaginable concreteness", to use Todorava's phrase, and they are not anymore as mystical as they used to be. They are as concrete and as real as anyone else but still somewhat as strange and as foreign to the European mindset as ever before. When the Balkans insists to become Europeans in a political and economic sense, Europe is hesitant to accept them, but when they turn their backs to Europe, Europe is crying to have them back. Thus, torn between the "othering" and "gathering" in their relation to the European Union, the Balkans are just an imagology or a diagnosis rather than a part and parcel of European geography. And, I would say, rightly so because, despite the fact that the history of the Balkans is inseparable from the overall history of Europe, the historical experience of the Balkans in terms of their ethnical, national, linguistic, religious and cultural diversity is very distinguishable. Thus, the description of the Balkans as the "other" than Europe is a correct one but not in the sense of a European pejorative prejudice, but rather in the sense of their perseverance in maintaining an ethnical, cultural and religious diversity throughout centuries. Against all odds, the Balkans are still one of the densest areas of ethnical, linguistic, religious and cultural diversity. I have no intention to advocate for the millet system practiced by the Ottoman Empire, which recognized the right of the "personal law" of the confessional communities such as the Muslim Sharia Law, Christian Canon law and the Jewish Halakha Law as independent bodies of law within the overall legal system of the Ottoman state, but I want to indicate to the fact that this millet system had been a vehicle for a preservation of specific religious as well as cultural identities of such communities. This is, perhaps, the main reason that the Balkans, unlike Europe, had no inquisition such as the Spanish inquisition, for example. Also, as my own apology of the Balkans before the European jury, I would like to say that if the term "balkanization", which was coined in the early 19th century, has a negative meaning because of the numerous new states that arose from the collapse of the Austro-Hungarian and Ottoman Empires in the Balkans, by the same token, the term "nationalization of Europe" might have the same negative connotation because of the numerous new states that arose in Europe from the collapse of the universal state represented in the idea of Christendom, which had turned to become many secular "nation states" but still with a recognizable Christian cultural nature. And I would like to join Maria Todorova in her apology of the Balkans against the charge of the Balkan "ancient hatred" as being an exclusively bad feature of the Balkans as such while she quotes the American journalist Roger Cohen, who explains that "the notion of killing people . . . because of something that may have happened in 1495 is unthinkable in the Western world. Not in the Balkans". In response to this charge, Todorova has pointed out that "He (Roger Cohen) is quite right. In the Balkans they were killing over something that happened over 500 years ago; in Europe, with a longer span of civilized memory, they were killing over something that happened 2,000 years ago. One is tempted to ask whether the Holocaust resulted from a "due" or "undue" predominance of barbarity". I don't want you to get the impression that the Balkans are better that the Europeans, but they are not worse than them either. In a compression of bad behavior in history the Balkans and the Europeans are almost equal, but in a comparison of a great historical advancement after a painful historical experience, the Europeans are far better than the Balkans because they have understood, unlike the Balkans, that, after all, "Historia est magistra vitae". And if anything, the Balkans, like Europe, are full of history - bad as well as good. It depends on the state of human mind which of these two are man's choice - bad or good historical example for a new action in a new history. And there is another characteristic that makes the Balkans interesting. Namely, the Balkans are good kingmakers rather than good kings themselves for themselves. Indeed, all imperial powers that ruled the Balkans were imperial as long as they had the Balkans under their political and economic control. This had happened to the Roman, Ottoman, Austria-Hungarian as well as recently to the imperial power of the Communist International (Comintern) represented in the power of the Soviet Union, which dominated over Bulgaria, Romania and Hungary and to some extent ex-Yugoslavia as well. Once, the imperial power loses its power over the Balkans, it loses its imperial title, it loses its prestige on the global stage. This is why the rivalry over the Balkans, which some like to call Eastern Europe as well, between the great world powers have been always a big contested issue and this is why the assassination of Archduke Franz Ferdinand of Austria had happened in Sarajevo in 1914 that ignited the First Epochal War in history and not elsewhere. However, I believe that we are talking here not about the clash of civilizations but rather about the clash of human minds. If anywhere it's in the Balkans that we have more than one world civilization. These different world civilizations have coexisted in the Balkans for centuries. Namely, the Orthodox Eastern European, the Western European, and the Islamic civilization, "of which the Orthodox European is primary" are still live civilizations in the Balkans. Before the advent of the Islamic civilization into the Balkans in the twelfth century, the Roman Emperor Diocletian (284-305) had divided the Roman Empire into two administrative haves. The invisible line of that division ran through the territory of Bosnia. Thus, marked by this invisible line between two administrative realms of the Roman Empire, Bosnia has been destined to remain a kind of buffer zone between two competing Christen dogmas: the dogma of the Orthodox Church of Byzantine and the dogma of the Catholic Church of Rome. This state of affairs is still present in Bosnia. However, Bosnia had belonged to neither of the two. Instead, it had had its own autocephaly Bosnian Church with its own religious doctrine of dualism or Manichaeism. The Bosnian Church (Bosnian: Crkva bosanska) was a Christian church in medieval Bosnia. It was autocephaly in the sense of not belonging either to the Roman Catholic or to the Eastern Orthodox Church hierarches. Because of that, it was considered heretical by both churches. Adherents to the Bosnian Church called themselves kristjans ("Christians") dobri Bošnjani ("Good Bosnians"). While Rome tried to avert the Bosnians from their heresy by an act of abjuration, the Orthodox Serbian Church issued a strong and lasting anathema against Bosnian Bogumilism in 1221 at the Monastery of Žiča, today's area of Sanjak in Serbia. This anathema had great consequences for the development of the religious and moral Bosnian mind because of a bad feeling that the Bosnian Bogumils had had about themselves due to this unwarranted curse-all anathema. Of course, it is not easy to anyone to bear a curse of a spiritual or psychological nature. So, when Islam had arrived in Bosnia in the fifteenth century with a message of freedom from this spiritual and psychological guilt, the Good Bosnians were more than happy to embrace the new faith. Hence is one the reasons why Islam had been rooted in the Bosnian soil so powerfully to this very day (Islam had arrived in Bosnia in 1463 by the Ottoman Sultan Mehmed Fatih the Magnificent). It is because of this removal of the Serbian Orthodox anathema over their heads that the Good Bosnians had had no big difficulty to adopt the worldview of Islam. It should be noticed though that this anathema of the thirteenth century has not been abolished and freed from the Bosnian soil, the Bosnian soul and the Bosnian mind. This anathema is still effective in some frozen minds of a remote mythical past. The magnitude of a lie always contains a certain factor of credibility, since the great masses of the people in the very bottom of their hearts tend to be corrupted rather than consciously and purposely evil, and that, therefore, in view of the primitive simplicity of their minds, they more easily fall victim to the big lie than to a little one, since they themselves lie in little things, but would be ashamed of lies that were too big. Such a falsehood will never enter their heads, and they will not be able to believe in the possibility of such monstrous effrontery and infamous misrepresentation in others… Therefor, something of even the most insolent lie will always remain and stick-a fact which all the great lie virtuosi and lying-clubs in the world know only too well and also make the most treacherous use of. No one has ever doubted that truth and politics are on rather bad terms with each other, and no one, as far as I know, has ever counted truthfulness among the political virtues. Lies have always been regarded as necessary and justifiable tools not only of the politician’s or the demagogue’s but also of the statesman’s trade . At the center of the political game is the lie: that is deliberate, organized, regulated, calculated, necessary deception: reasoning about politics while excluding the lie leads to an abusive naïve vision, to an error of evaluation. To believe that there can be a politics without lying would seem illusory: political life, the way it is practiced, supposes an elevated rate, a tight web of lies of different forms and degrees. But do the politicians have the monopoly on lying? No, they do not have such monopoly. They have only the political power, which enables them to lie "creatively, imaginatively and inventively", as Dobrica Čosić said. Today, every one has the "right" to lie and every one has the right to make his/her own "fake news". Indeed, today, every one is a self-editor of self-newspaper, self-image, self-promotion, self-censorship, self-recognition and self-realization on Facebook, Tweeter, Instagram, etc. Thus, no one has the monopoly on the truth either. But, every one has the right to his/her own truth as well as his/her own lie. So, the monopoly on the lie, which was a politicians' privilege, as Hannah Arendt and Pierre Lenan have pointed out, is not any more an exclusive right and warrant of politics. Today the laying is a common feature in other fields as well: in sports, in banks, in schools, in trades, etc. It used to be a rule that the politicians don't know how to tell the truth, the priests don't know how to tell the lie, and the journalists don't know how to make the difference between the two. Now, this old rule has been broken. After all, some politicians do know how to tell the truth, but people still don't believe them, although they still vote for them again and again despite the fact that they have previously lied to them. Unfortunately, some priests have broken their oath of covenant with God and their contract with men not to lie. They have been caught not only lying bat also hiding their lies. Thus, some of them lost the public trust. And, of course, we should give a credit to some bold journalists who know how to make a difference between the truth and lie. But, the most notorious of lies happened in banks. The Bernie Madoff's lie in banking was as big as Hitler's lie. Yes, this is exactly what I want to say: we are as humanity in a big crisis of public trust not only in politics, but also in almost all fields of life. People nowadays have difficulty to reason with each other and thus they ran away from each other. In such a state of human mind, the only thing that attracts people's attention as a sensible to their mind is a satire and cynicism. It seems that this was what Desiderius Erasmus Roterodamus had in mind in 1505 when he wrote his "The Praise of Folly, and this was what the great Muslim writer Abu Hayyan Al-Tawheedi (d. 1023) had in mind when he burnt his books before his death because he thought that people were so much indulged in their follies that no one will read his books of reasoning. It was the French polymath Gustave Le Bon (1841- 1931) who studied the mind of crowd and came to the conclusion that "a crowd is as easily heroic as criminal". And I would add to it that to start a war is as easily as having a piece of cake, but to stop it and to start peace is as hard as climbing to the Himalayas. If you ask why is so, I would say, as Gustave Le bon has noticed, that experience has not taught men as yet to a sufficient degree to conduct himself upon the teaching of pure reason. Instead, men as a crowd behave out of their unconscious power, which is stronger than their pure individual reason and their personal virtuous morality. History, says Gustave Le Bon, tells us that the moment when the moral forces on which a civilization rested have lost their strength, its final dissolution is brought about by those unconscious and brutal crowds known, justifiably enough, as barbarians. Are we today in such a state of barbarism because of populism, extremism and the New Media?